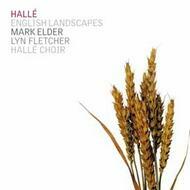 A stunning collection of works inspired by the English landscape including the ever popular Tintagel and The Lark Ascending - a further release in the Halle�s highly acclaimed catalogue of British music. There is special interest in the two little recorded part-songs by Ireland and Elgar, featuring Hall� Choir recently praised for the role in Elgar The Music Makers (CDHLL7509) �[Elder] goes to the heart of the music and takes his orchestra and the superb choir with him.� The Sunday Telegraph. The Music Makers was short-listed for Gramophone Awards 2006. Mark Elder winner of the RPS Conductor Awards 2006, judges� citation read: �In addition to the sheer excellence ofhis music-making Mark Elder has a passionate commitment to communicating with audiences wherever he works�. The Hall� had itself won the RPS Ensemble Award in 2005, when the judges said �The revival of the Hall� under Mark Elder is one of the great success stories of British classical music � this is an organisation invigorated with purpose�.